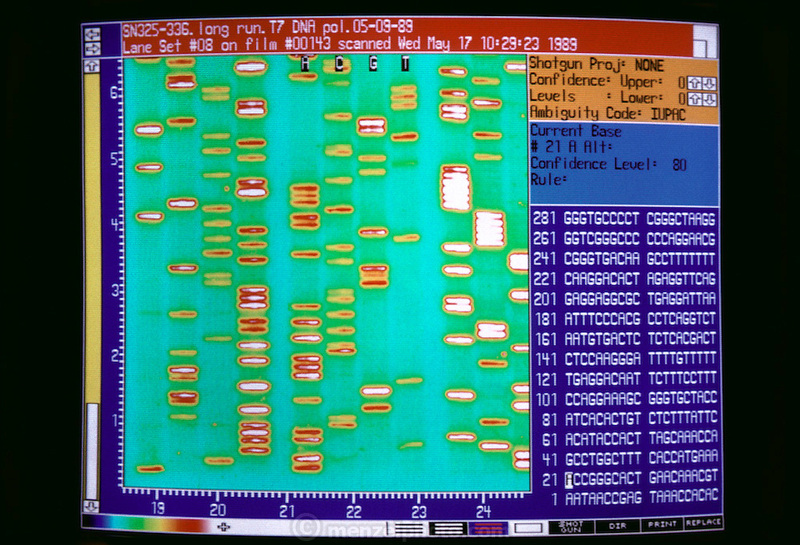 Research on the human genome: laboratory at Columbia University, Lee Hood Lab, New York, showing row of electrophoresis gels used for DNA sequencing experiments on human chromosomes. DNA sequencing involves decoding the base pair sequence of sections of DNA - most usefully, those sections called genes which encode specific proteins. Sequencing and mapping - surveying each of the 23 pairs of human chromosomes to locate genes or other important markers - are two phases in the human genome project. Constructing such a complete genetic map involves a detailed biochemical survey of every gene expressed on all 23 pairs of human chromosomes.